- Canoeing photos, and paddling, boating, canoe trips, paddlers, canoes, whitewater and flatwater. Canoeing on lakes and rivers, including the Red Trail, in the Okenefokee Swamp in southern Georgia. Also canoing and canoes in Moraine Lake, Banff National Park, Alberta, Canada. Canoe trip, Okefenokee Swamp, Georgia. 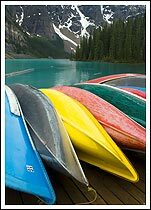 Canoes, Moraine Lake, Banff National Park, Alberta, Canada. Canoeist, Moraine Lake, Banff National Park, Alberta, Canada.